I had been looking forward to the weekend all week and it had finally arrived, Thursday evening. In less than twelve hours, I would be on my way! I was trying to send out a few last emails to let my parents and a few friends know that I would be off the grid, but a thunder storm was passing over Houay Xai and the electricity kept cutting out, which also made packing a little challenging. My pocket flashlight was proving its worth once again as I decided what to take with me and rearranged the items in my bags. I would be leaving my large pack behind in storage and taking only my small backpack with me for the weekend. And although I was brimming with excitement, I needed to go to bed… Friday was going to be a long day and I knew I should get a good night’s sleep. On Friday morning, I awoke to another thunderstorm, which immediately made me jump out of bed to get an early start since I would need to walk 10 or 15 minutes down the street in the downpour to get to my meeting spot. I took one last look around my guesthouse room to make sure I had everything, pulled out my backpack rain cover, and threw a poncho over the rest of me. I stepped out into the pummeling rain and was mentally patting myself on the back for being so prepared with all of my rain gear. When I arrived at The Gibbon Experience office, one of the office workers was standing outside because she didn’t have a key. The office wouldn’t open until 8am, which was in ten minutes, so I left my packs with her and went across the street to buy a few snacks and some breakfast. By the time I came back, the office was swarming with backpackers, all stowing their packs, double checking final items, surveying the room, and exchanging stories as only backpackers can… comparing who’s travels have been the longest, who’s have been the farthest, the most remote, the craziest night, the cheapest room… on and on. I sat down next to a girl named Julie, whom I mistakenly thought was with a group of Aussies. 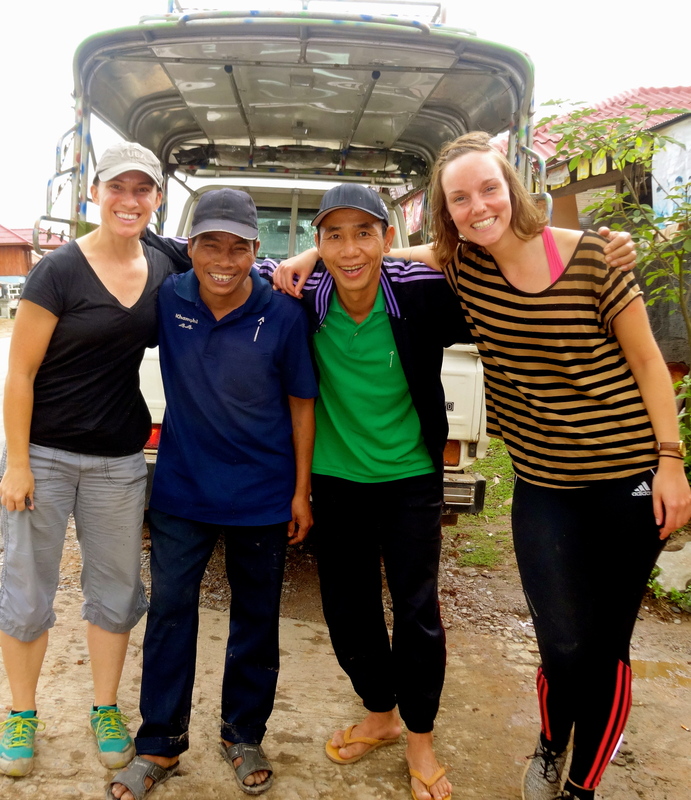 She wasn’t; she was from Denmark and had just arrived in Houay Xai from Luang Prabang like the majority of us who had come for this experience. 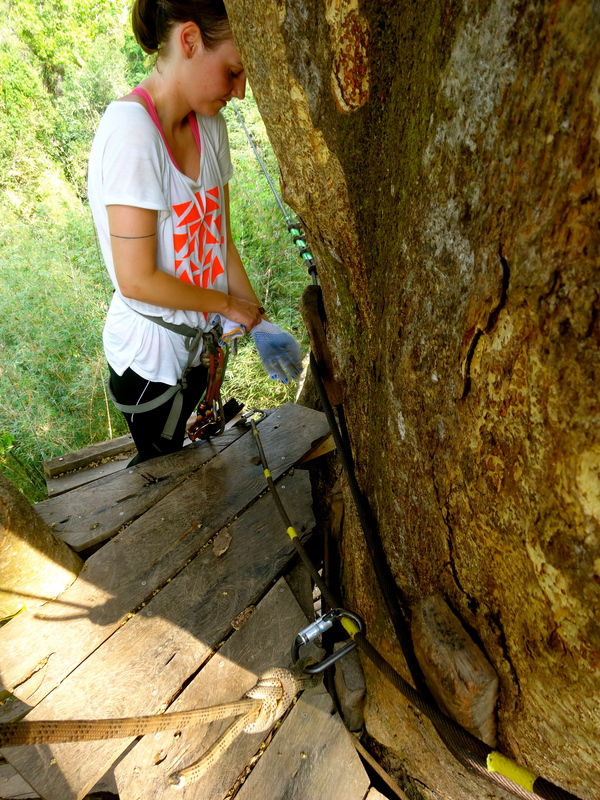 As explained on their website, The Gibbon Experience is an eco tourism forest conservation project. 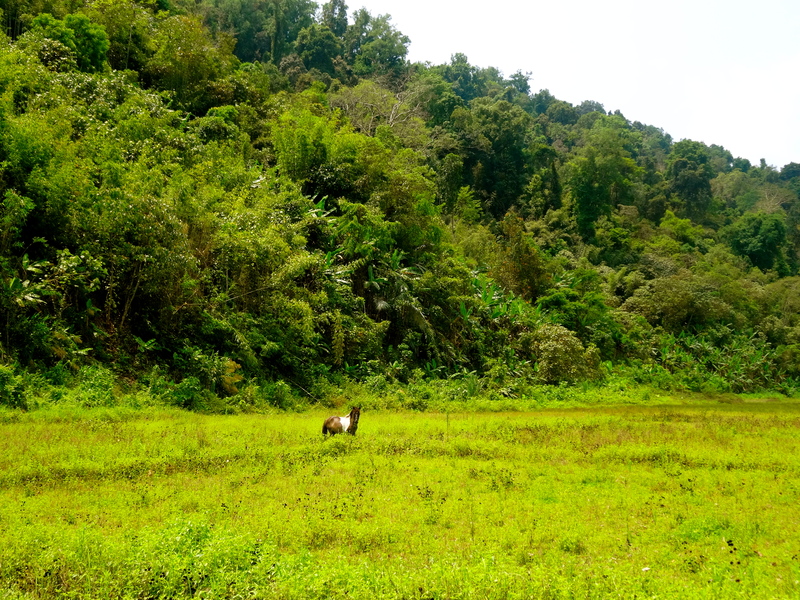 It funds forest protection and community projects in the Bokeo Nature Reserve in Northern Laos. 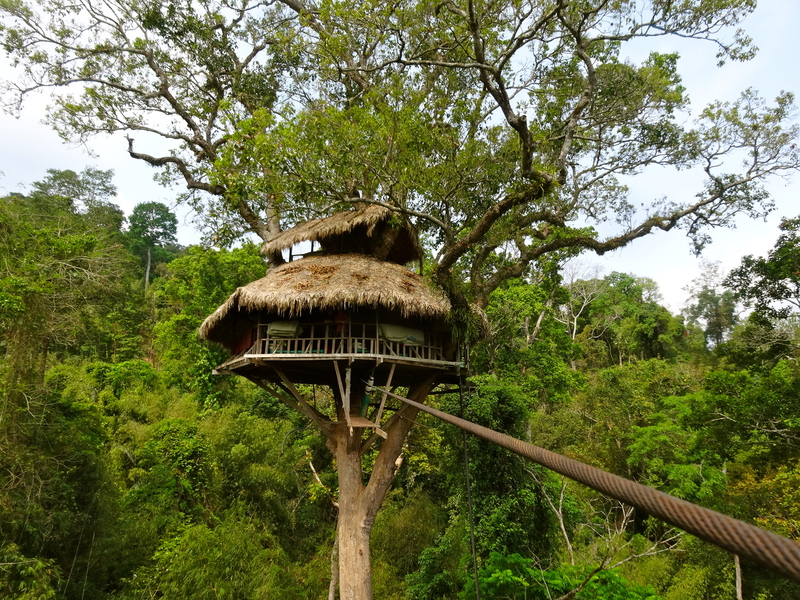 Guests stay in tree houses in the nature reserve and participate in one of three different excursions, an express one-night stay, a classic two-night stay, or a waterfall two-night stay. We were all trying to determine who was in which group and share what we had heard from other travelers about the experience. 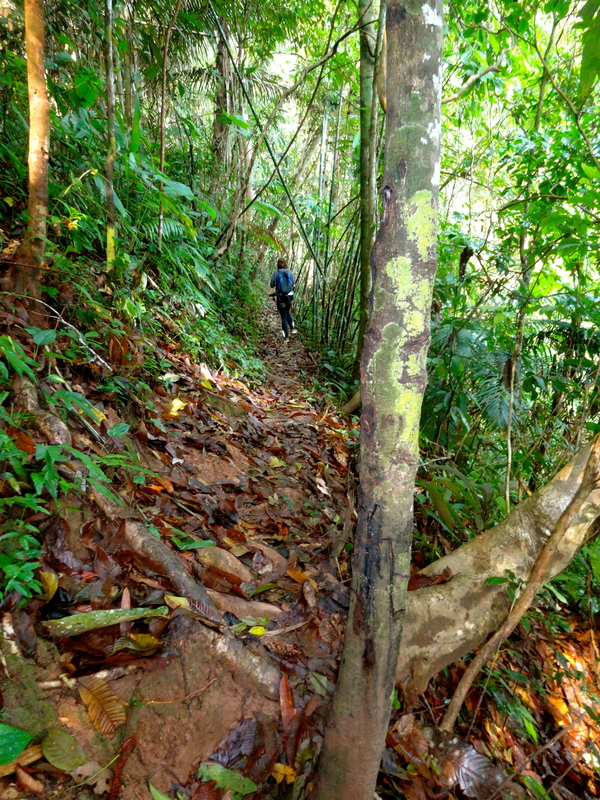 On the website, it indicates that it is best to wear long pants or high socks because there are leeches in the jungle. We debate this fact as we all sit there in our shorts or three-quarter length pants until one girl says she just talked to another backpacker two days ago who had returned from the jungle and said that there were leeches everywhere. We silently looked at each other with wide-eyed fear and one by one, searched our packs for long pants, then discretely slipped away to the restroom to change. 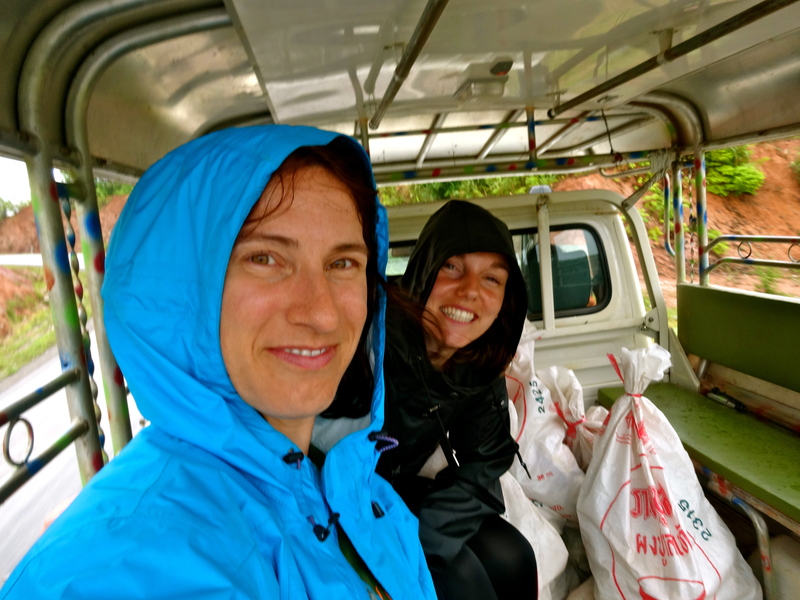 Julie and I in the back of our truck… on our way to the Bokeo Nature Reserve after a rainy morning. quickly determined that we would simply become the best of friends. We hopped in the back of a 4-wheel drive truck, which closely resembled a tuk-tuk with a caged back cover and bench seats. The seats were wet, but it had stopped raining. Without introductions, our driver jumped inside, started up the engine and pulled onto the road. It was 9:15am. As we drove, we made random stops to pick up an elderly woman and a mother carrying a baby, then a guy who turned out to be one of the guides with the program… then another guide, then drop off the elderly woman. It didn’t even faze me. 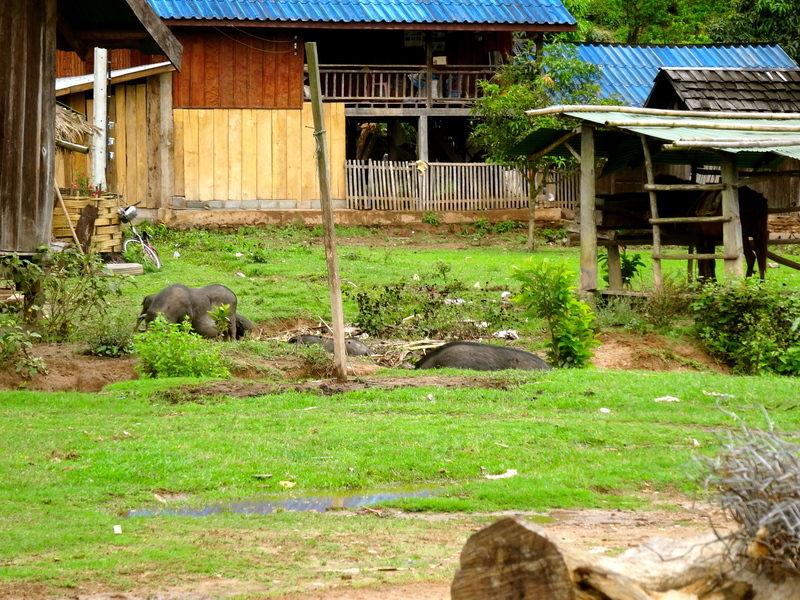 I had experienced the same type of casual stops every time that I was in a vehicle in Laos, whether it was in someone’s personal vehicle, on a public bus, or Soaring along the Mekong. There is very little transportation in remote areas and it seems to be an unspoken rule that the community helps one another get to where they need to go. 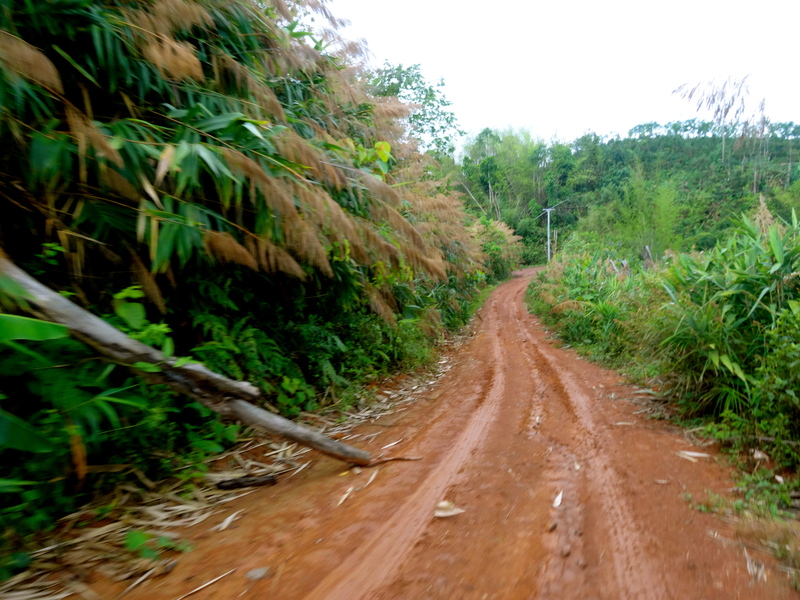 Our off-road mountain drive into the Bokeo Nature Reserve. Remote village on the edge of the Bokeo Nature Reserve. we started driving again, the truck did not pull back onto the road, but instead headed down a narrow, muddy, dirt road and shifted into low gear. We crossed a river, bounced over some rocks and started uphill into the mountains. 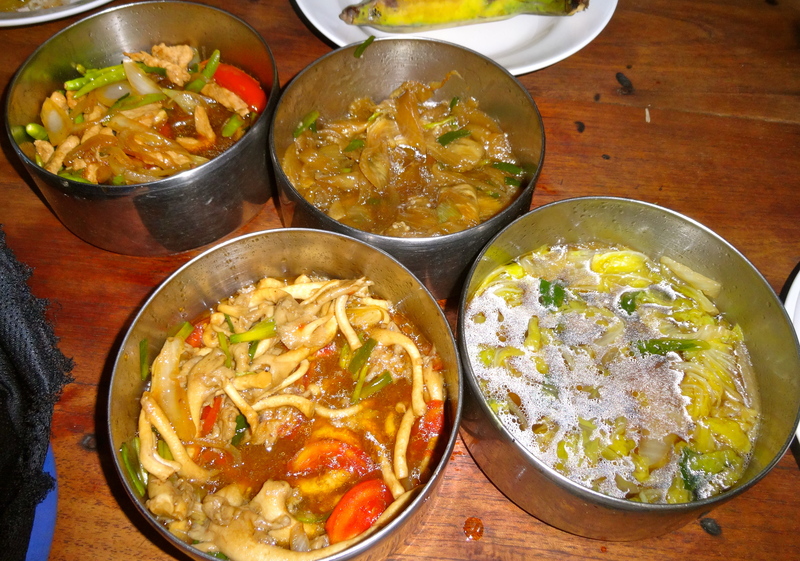 It took almost another hour driving up and down hills, through muddy ditches, around sharp curves and fallen trees while branches scraped the truck, to get to a very remote village with about a dozen aluminum or thatched roof houses. Our guides jumped out and motioned for us to follow. Two more guides joined us… now two of us and six guides. Trekking across open fields to get to the forest. 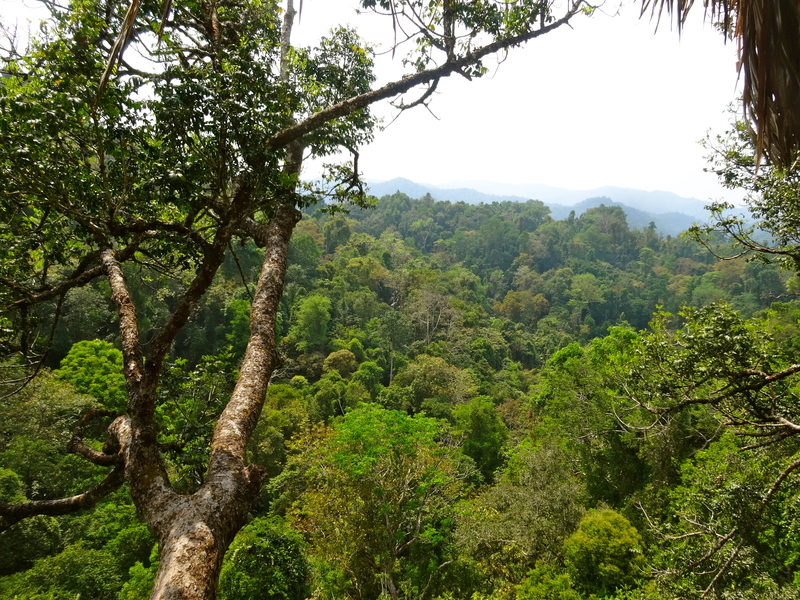 The jungle of the Bokeo Nature Reserve. There were no more roads, only trails. 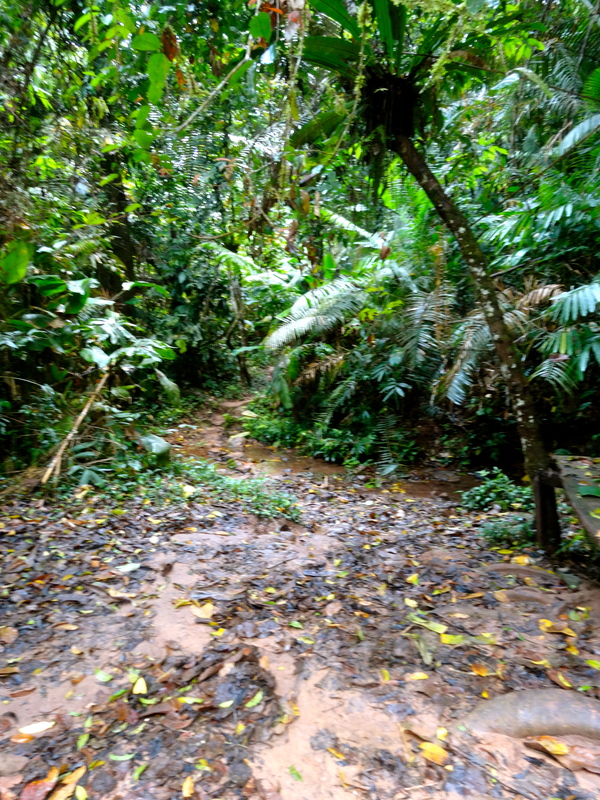 We strapped on our backpacks and trekked away from the village, across streams, along fields, through mud, and eventually into the jungle. We had only been hiking for about thirty minutes, when Julie and I peeled off our rain jackets, searched for our water, and pulled our hair back off of our necks. The post rain jungle humidity was thick and we were both already glistening with sweat. Our guides stopped at a spot where there were a few benches and pulled out sandwiches for a quick lunch break. Julie and I each took one without realizing that there weren’t enough for everyone. Each of the guides had torn their sandwich in half to share, but they were still one short. I felt guilty. Despite my growling hunger, I ripped my sandwich in half and handed it to the last guide, who reluctantly took it. Julie hiking up our trail in the jungle. found that it was too difficult on the slippery trail and nearly lost my balance on the hill I was climbing. The friendly guide with whom I had shared my sandwich was instantly at my side to steady my footing and find me a bamboo walking stick. 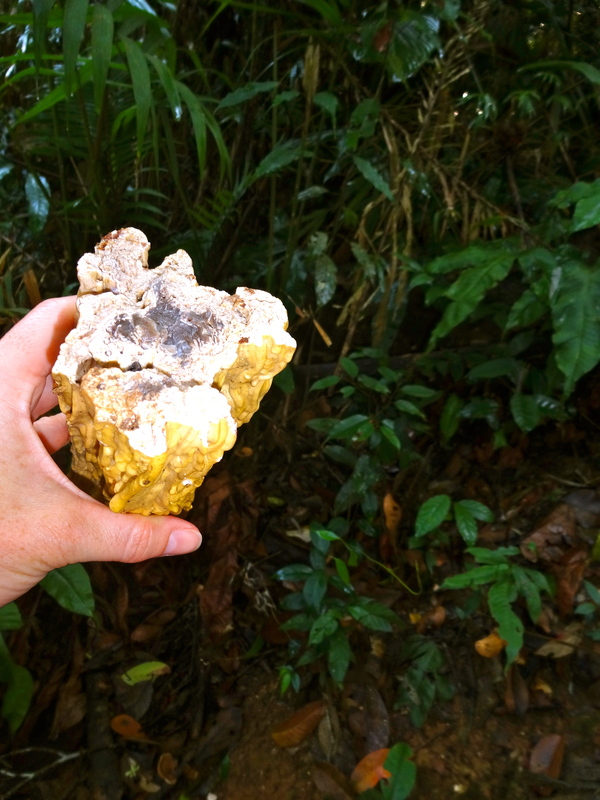 As we continued our arduous ascent, I was deliberately controlling my breathing and carefully placing my footsteps, my heart pounding and my ears alertly listening to all of the jungle noises. The guides walking with us were casually chatting and laughing as they ambled along in their flip-flops as if it were a stroll in the park. It put my level of fitness in a whole new perspective. After about an hour of trekking, we arrived at a cabin in a clearing. There were men standing idle on the porch, observing our approach. Our guides strolled up and exchanged pleasantries as if they were greeting family and told Julie and I we would take another ten minute break. By that point, we were drenched in sweat, reapplying our mosquito repellant, and discussing whether either of us had seen any leeches. Before we started walking again, two new guides introduced themselves and handed Julie and I each a harness and showed us how to properly adjust it. Their names were Bounleun and Khamphi. Four of the previous guides stayed behind at the cabin, while two of them continued on with Bounleun, Khamphi, Julie & I. The last part of our trek would involve a network of zip lines to get to our tree house, however, the zip lines weren’t all connected. They were just as much functional for crossing the jungle as fun, so there would be some hiking, then a zip line, then more hiking. Me on my zip line! a mental checklist… harness, check. Trolley, check. Safety line, check. Right hand on top, check. Left hand on ropes, check. Deep breath, check. Goooooooooooooo! Legs tucked, check. Lean back, check. “Wow, I’m going really fast”. Break, break, break, check. I stopped about 3 meters short of the landing platform thanks to my extra breaking and had to spin around and pull myself in, hand over hand. Whew, I made it. It was scary, adrenaline-charged, and exciting! The safety line – Julie and I hooked into our nexus of zip lines. One of our jungle tree houses. until we felt really comfortable. Once we finished, we hiked some more and eventually reached our final zip line around 2pm, which would take us to the front door of our tree house. How fantastic is that? 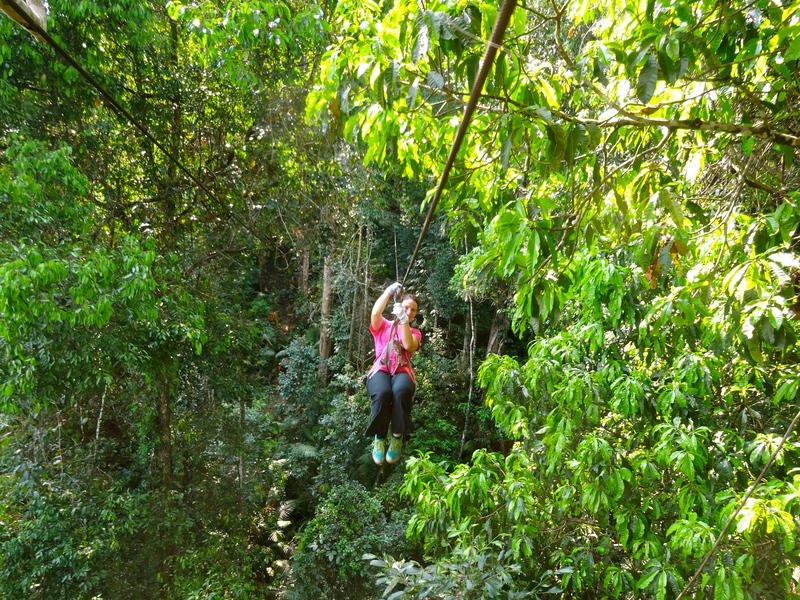 The only way to enter any of the tree houses in the forest was by zip line. 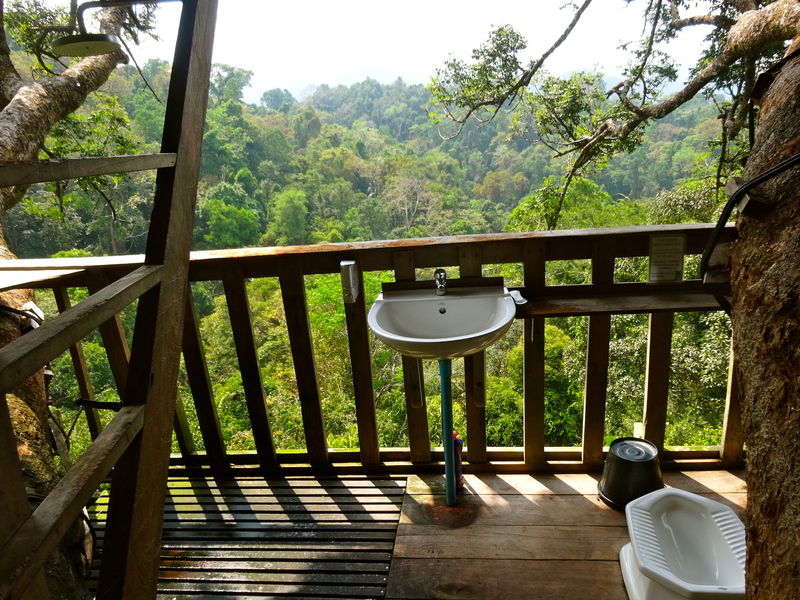 Our outdoor bathroom with rainforest shower. 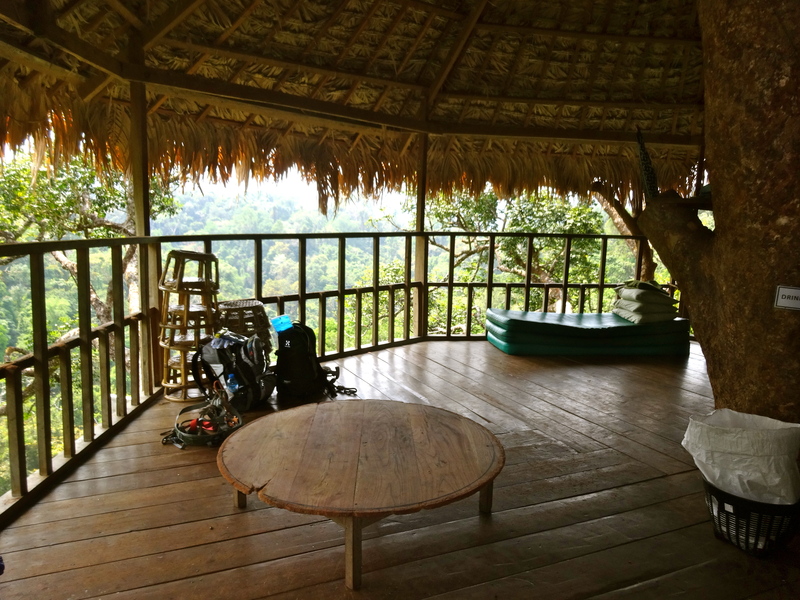 The main living area in our tree house. As we stepped into our little piece of heaven in the sky, we were stunned. We stepped through a spring loaded, waist high, wooden gate into the entrance, where, just like with any Lao home, we left our shoes. Around the other side of the tree on the same level as our front door was a green curtain. When we pulled it back, we stepped down three stairs to our outdoor bathroom in the sky. Next to the entrance was a set of stairs that led up to the main floor, where there was a kitchen, a low, round dining table, a few stools, and the makings for our beds that evening. 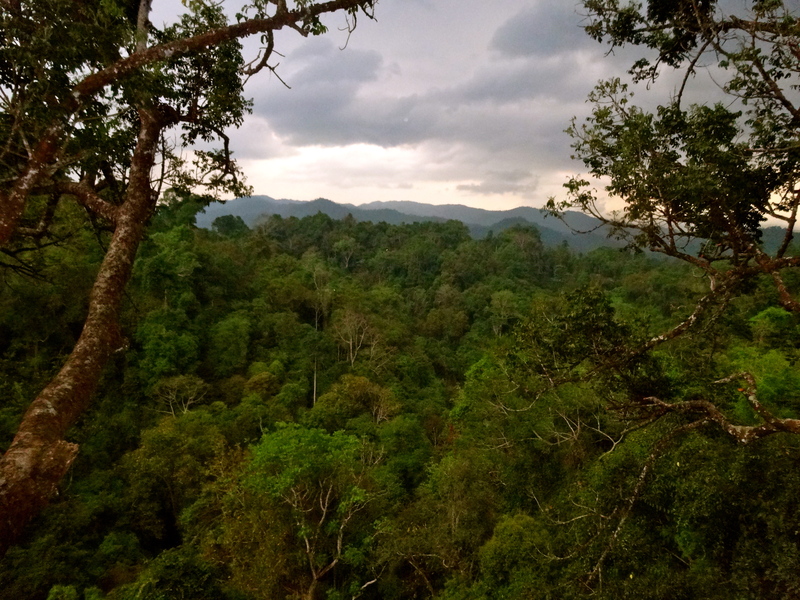 The tree house was round so we had amazing panoramic views of the jungle no matter where we looked. From the main floor, there was another set of stairs that led up to a crow’s nest, that our guides jokingly called the honeymoon suite because at the top of the stairs, there was a door in the floor that closed to offer privacy from the floor below. 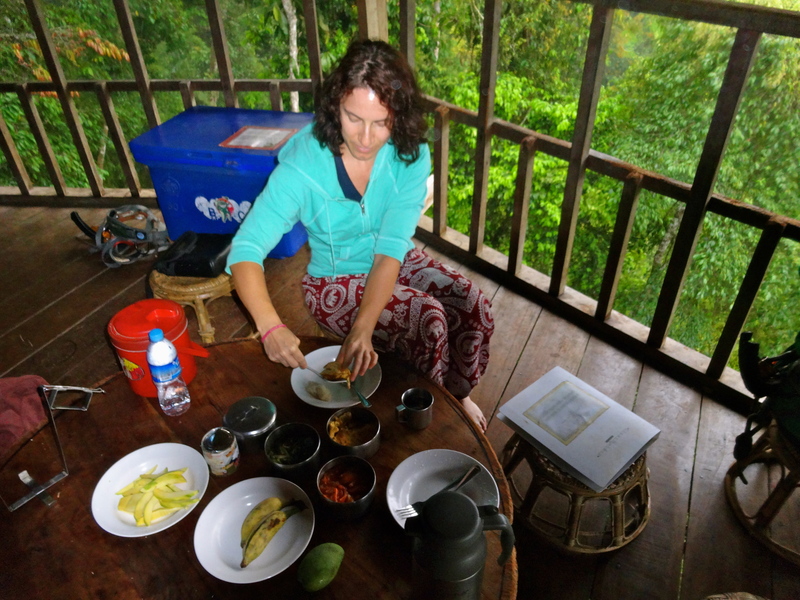 Our guides pulled a melon, a mango, and some homemade corn and rice treats out of a cooler next to our kitchen, cut them up and served us so that we could have a snack and enjoy the view. It was 2:30pm and after they shared some fun facts about the forest, they let us know that they would be back around 5pm with dinner, but for now, they would leave us to allow us to settle in and relax. They would be staying in a small cabin at the other end of our zip line and up a short hill, where there was a camp for the guides, cooks, and other workers. This is where our meals would be made. After more than a five-hour voyage into the forest, Julie and I were exhausted, but I found it hard to stand up from my little stool, either because my legs were too tired to work or I was still in shock. I’m not sure. I was overwhelmed by our magnificent surroundings. In due time, I managed to muster myself to my feet, unpack my bag, and venture down to test our outdoor bathroom. Standing naked under our rainforest showerhead, staring down at the trees and the wide, open expanse of the jungle, I’ve never felt more connected with nature. It was also one of the best showers I had experienced in Laos because the architect of this tree house managed to tap into a mountain stream that offered fresh water, albeit cold, and fantastic water pressure. After I changed and set up my mattress for bed, I just sat there listening to the birds chirping, the insects buzzing, and the cicadas humming. The jungle was alive and full of energy. dinner as dark clouds rolled across the mountains. We were sitting there watching those clouds blow closer toward us; lightening flashes illuminating the sky while thunder was rumbling in the distance. Like a whirlwind, we heard Bounleun and Khamphi zip into the house almost simultaneously and rush up the stairs. “Put on your harness”, they said, “you need to come back to the hut with us. There is a storm coming”. 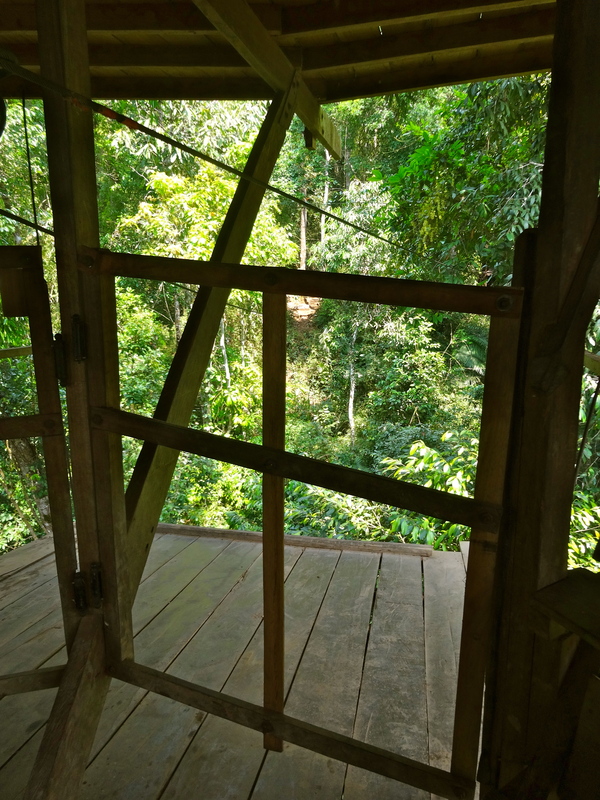 This we knew and were actually kind of excited about watching from our tree house but apparently the guides get a little nervous about leaving visitors in the tree house when there is lightening, so they whisked us away. The storm rolled in quickly so we sat with the cabin crew practicing our Lao, learning about the upcoming Lao New Year, and asking each person how he or she had gotten started with this program. There were three cooks, all teenage girls, two other guides, and a young guy who helped out wherever they needed him, whether it was clearing trails, transporting groceries, or checking zip lines. He was young and eager and he wanted to learn everything about the program. It was a little unfortunate that these young kids weren’t in school, but they all seemed really passionate about the work that they did and pleased to be part of the reserve. 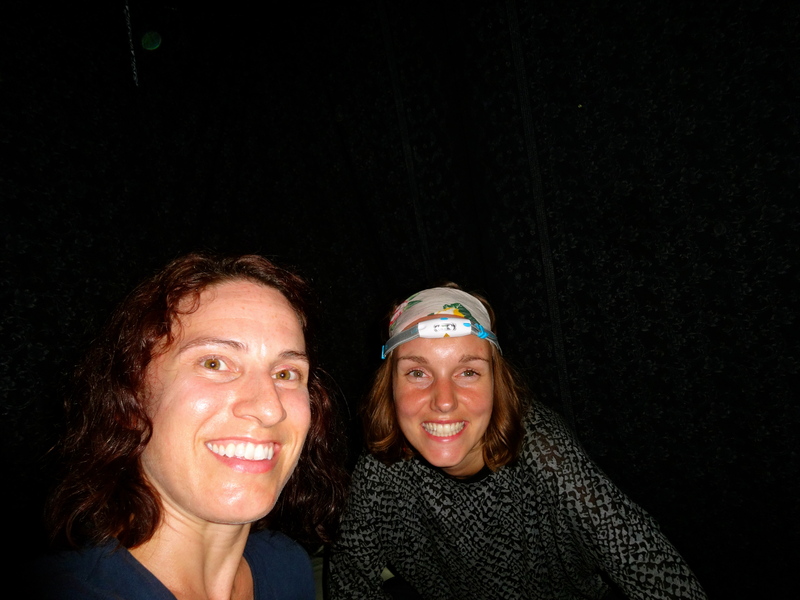 Julie and I playing cards with the help of flashlights under our mosquito net. They know how to play Rummy in Denmark. Once the storm passed, we zipped back over to the tree house. It was only 7:30pm, so Julie and I played some cards by the light of our flashlights, and then went to bed around 9pm. I thought that I would fall asleep instantly after all the exertion of the day, but it took me a little time to get used to the sounds in the jungle. I woke two or three times during the night to unfamiliar reverberations that I was certain were either possums or rats. I didn’t want to look. Unfortunately, the zip lines couldn’t keep all of the critters out of our house… after all, we were technically visitors in their neighborhood. 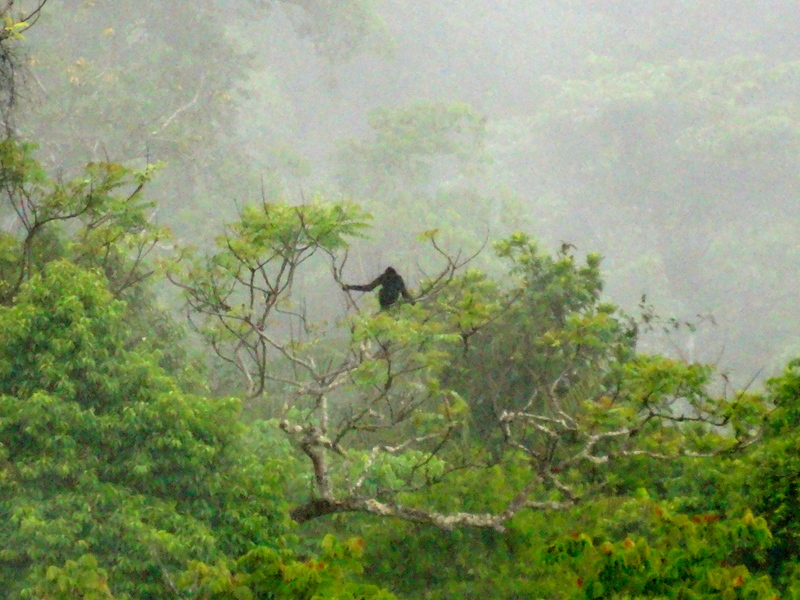 In the morning, just before 6am, we were thrilled to be woken by what we were hoping to hear… singing black gibbons. In 1997, a once thought extinct population of Western Black Crested Gibbons was discovered in the forest, and shortly after that time, The Gibbon Experience was created to help raise awareness, funding, and create conservation projects. In the southern part of the Nam Kan National Protected Area, there are only 11 distinct groups of gibbons, so there is no guarantee that visitors will see them while there. However, the gibbon’s siren-like singing is distinct and echoes through the forest so even if they can’t be seen, they can often be heard, especially around sunrise. 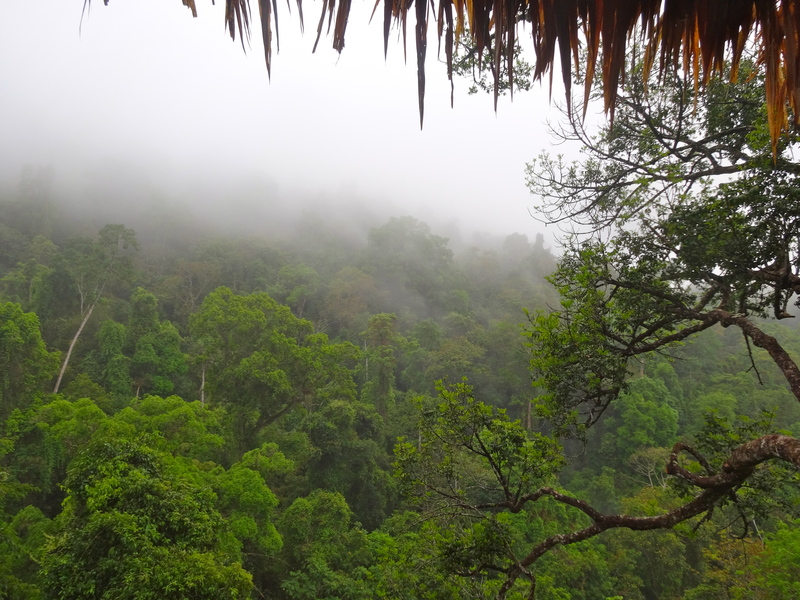 We heard the singing for at least a half hour off in the distance and sat there scouring the forest in the hopes of getting a glimpse, but there was a mist hanging over the trees from more overnight rain so we never found them. Dishing up a tasty breakfast. 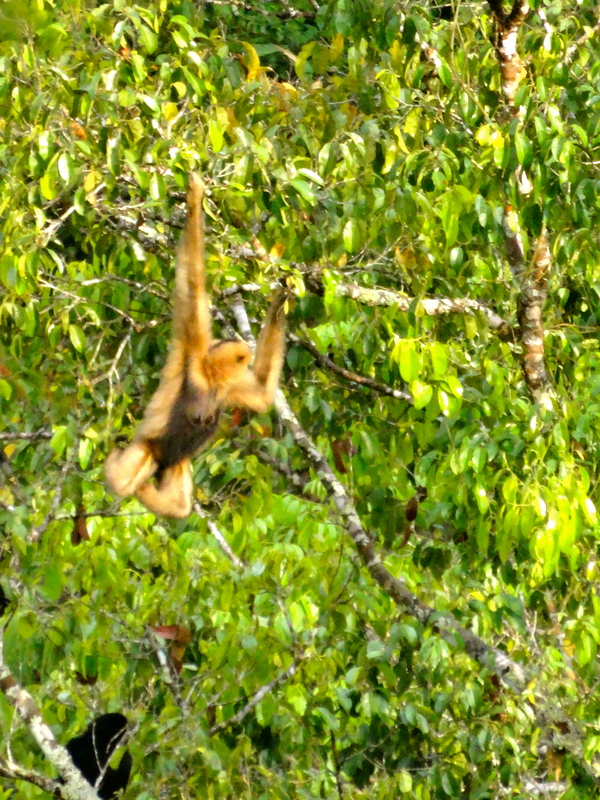 My first Western Black Crested Gibbon sighting in the jungle. Brothers and sisters – a happy little family of gibbons. Momma Gibbon – recognized because of her lighter brown color. sink”. Then I saw it, two black arms, then it’s head before it swung to the next branch and the tree rustled. I raced up the stairs with a mouth full of white foam and my toothbrush hanging out the side, grabbed my camera, and just pointed in the general direction for Julie. She knew exactly what I meant. 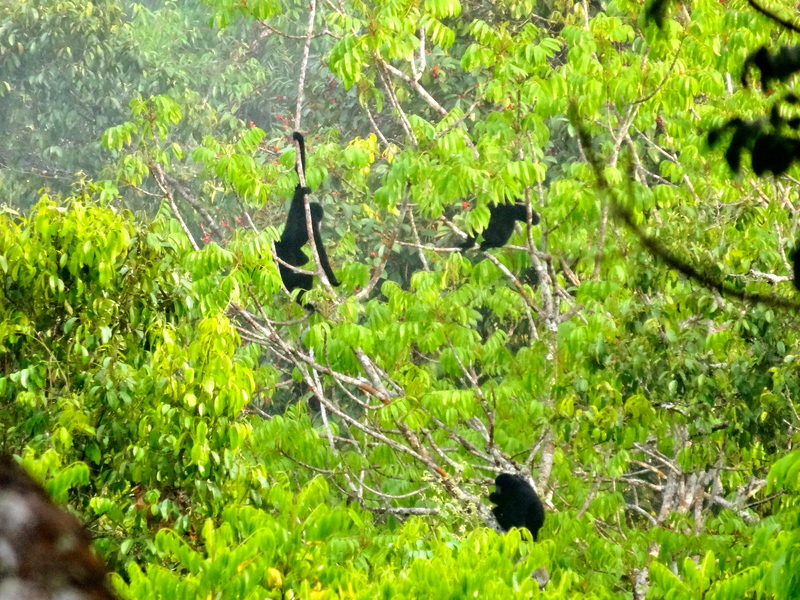 I went back downstairs where I had such a clear view, finished brushing my teeth, and stared in awe as three more black gibbons appeared. They were playing, talking, doing tree branch gymnastics, wrestling… they were so amazing with their long black arms that were twice the length of their body. Then a female appeared with her light brown fur; this group was clearly a family. Gibbons are monogamous and have a low birth rate with only one offspring at a time, which is usually spaced out every 2 to 3 years due to an 8-month gestation period. Gibbons never really leave the tree canopy, living their lives at about 50 meter altitudes, so our tree house afforded us the opportunity to be the nosey neighbors with an amazing view through the window of the house across the street. 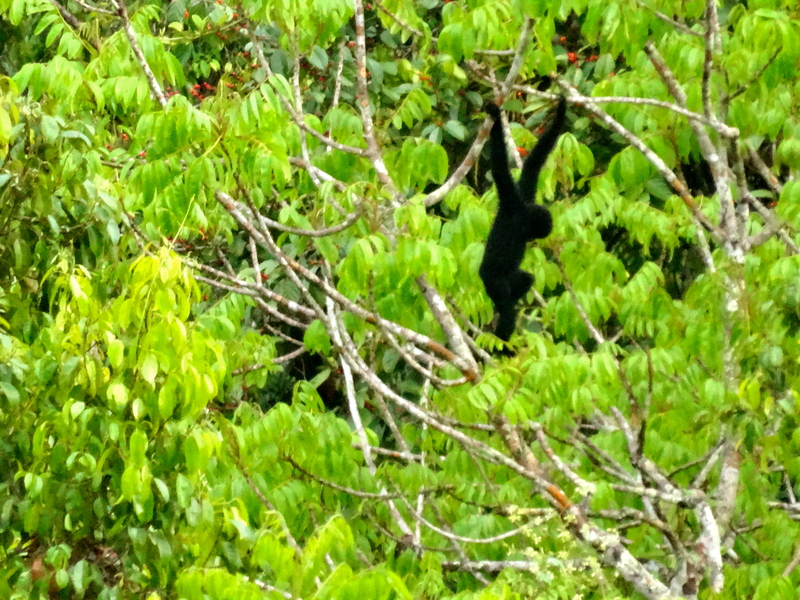 We could see the gibbons move across the treetops on their own little excursion to find food until they were out of sight about forty minutes later. It was like going to the theatre and watching a movie that was so riveting, when it ended you needed a moment to let it all sink in so you just sat there watching the credits, unable to move, wondering who created that masterpiece… what a phenomenal past 24 hours. 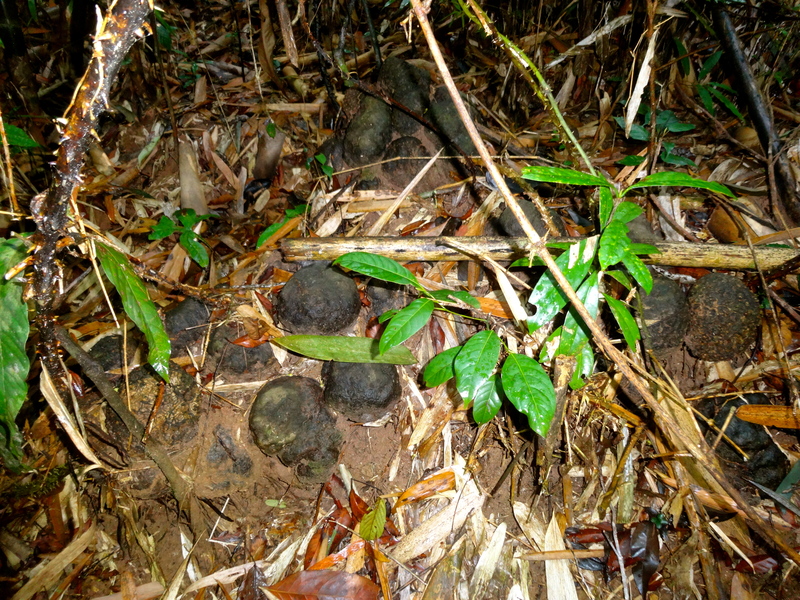 Some kind of root that is used for medicine. Hardened sap from one of the trees. Bounleun will use it in their New Year’s campfire. Gibbon in the mist. King of this jungle. From left to right: me, Khamphi, Bounleun, and Julie. When I set out on my tour around the world 18 months ago, I never could have imagined that I would have an experience like the past weekend. I’ve never been more grateful for stepping out of my comfort zone, letting the winds blow me, and somehow landing in a country that was never on my original travel list. This experience with its long haul, challenging treks, and plethora of insects and jungle creatures may not be the experience for everyone, but I hope it makes you want to take a little step outside of your comfort zone… because who knows what could come next.